We feel that the “African Safari” has become a bit like a franchise, the same wherever you go, way too much “image” and not enough down-to-earth fun. We offer traditional, robust safaris that focus on the wildlife, amazing locations, new experiences, and having fun. There are no cell phones, no wi-fi, and no spa treatments! We do offer good food, comfy beds, great stars, engaging guides, and an amazing adventure. Equipment: Our vehicles are specially modified, all terrain, 4 x 4 game viewers. We pack everything we need: tough tents, chairs, tables, paraffin lights, a toilet and shower, tools, a sat phone for emergencies, cork screw, and, very very importantly, plenty of food and drink. It’s the way safaris used to be. We’ve grown a bit soft over the years so now we have stretcher beds with comfy mattresses, bigger tents and an actual toilet seat but the principle is the same: living and breathing the African bush. The Team: While you’re with us you won’t need to lift a finger. When you arrive the vehicles will be packed and ready for the off, one of our very experienced guides will drive you and introduce you to the bush and it’s wonders – the flora, the fauna, what you can and can’t eat, what will eat you....Our camp chef will cook for you, and our camp assistant/cook will put up tents, make beds, heat water for showers and generally look after you. The locations: Almost all the camping spots we use are private– we will be the only people there. When we arrive there is nothing, when we leave there is nothing. The camps are unfenced and so wildlife frequently wonder through – you need to keep your wits about you and listen to your guide. It’s all part of the adventure. There are no tight schedules, no itineraries, no clock watching. We can go with the flow – if the wildlife is pumping that morning we can hang around all day, if not we go back to camp and enjoy the uniqueness of being in the bush with no fences, amazing sounds and starry nights. 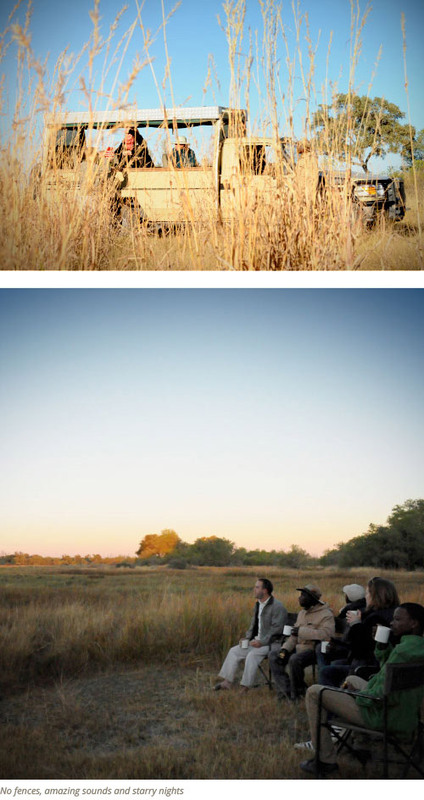 It’s your safari – you set the pace. 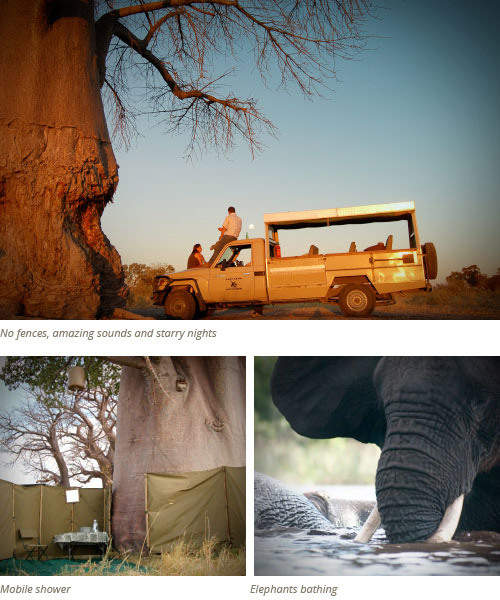 Because the national parks are not fenced – it’s a true wilderness – you can start spotting game within 40 minutes of leaving Audi Camp base in Maun. Time to set up camp. Most of our camping spots are private. There’s nothing there just bush. We bring everything and, most importantly take everything away with us at the end. So you can enjoy pristine bush. First things first, we need a loo. KB and Tshiamo (both Audi veterans) set up camp. It’s impressive to watch how quickly it comes together and there’s no need to help, they’re faster without you. While camp get’s sorted we abandon the guys for a sundowners somewhere stunning. Sorry KB. The morning drive is up but it’s worth going back to camp. Man sized breakfasts are the order of the day. As the day cools down you head out with an afternoon picnic to the watering hole, quenching your thirst as the wildlife approach to quench theirs. What a sunset. A beautiful end to another beautiful day. It’s time for you to head back to camp...Thank you BK, KB and Tshiamo for another amazing experience. Not a lot. We provide everything you aren’t wearing, reading, or cleaning/medicating yourself with! A good pair of binoculars and a camera are handy. We take guide books but you may prefer your own. We provide wine with dinner but please feel free to bring other alcoholic/soft drinks with you (there are bottle stores in town or you can buy beer and wine etc from Audi Camp bar before we leave Maun). We provide drinking water, coffee, tea, and juice throughout the day. The summer months can be very, very hot (35-45 degrees) but with dramatic downpours which can, temporarily leave you wanting a rain mac. The winter months can be seriously cold in the early morning and at night – you’ll want long trousers, jumpers, a jacket, even hats and gloves for the open vehicles. By late morning Africa warms up and you will be stripping off so bring a mixed bag! NB* You won’t want to waste time washing clothes on safari so bring what you need but bare in mind that’s it’s almost compulsory to be a bit grubby on safari. So here the idea is to layer. It starts out really cold and all you want to do is stay under the duvet and then it gets really hot and you wish you could dive into the Okavango (don’t – there are crocodiles!!). A beanie or woolly hat is also quite useful for early mornings. Whether you want to pepper your safari with some additional treats or want to squeeze in a day-trip as you pass through Maun on a self- drive, we can help. We have great relationships with the local helicopter charter companies and pilots and can arrange all sorts of wonderful extras for you. 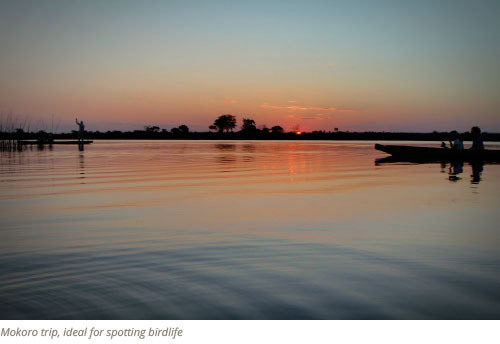 If exploring the delta by boat is more your thing (and it really is a beautiful way to do things) we can arrange a Trans-Okavango in a house or motor boat; or you can poodle through the tiny waterways and back channels in a traditional dug-out canoe with your own poler/ guide and camp on remote palm fringed islands. Ahh lovely! If you have a bit more time on your hands consider a trip to the World famous San paintings at Tsodilo Hills – you’ll need at least two days. For more information on any of these trips please contact us. Over the road from Audi Camp is our new place – Motsana. There we have a coffee shop, hairdresser, beauty salon,health shop, art gallery. You can also get curios, and a variety of gifts. We do movies once a week on a Thurs evening, farmers market on a Sunday at the end of every month and every now and again a live show.